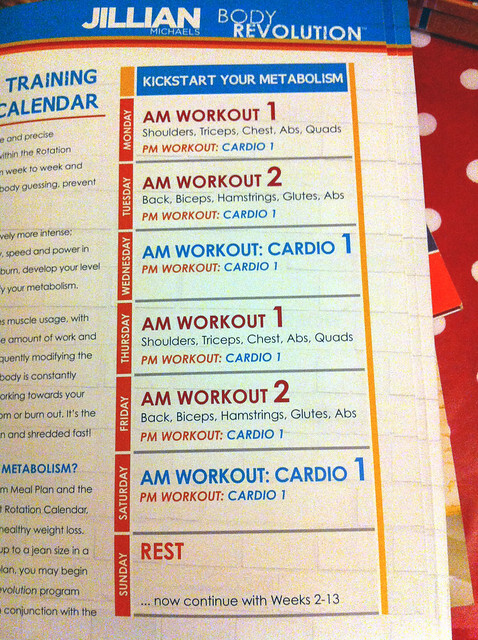 The programme lasts for 90 days, and contains 12 different weight workouts and three cardio workouts. 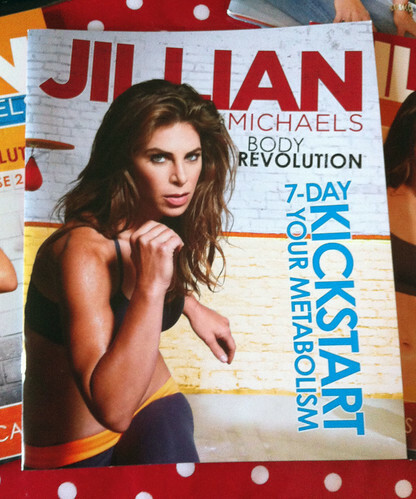 The reason I was keen to try this particular programme is that it alternates muscle groups – something which Jillian’s other DVDs don’t do. The idea is that you work one group of muscles, and then give them time to rest so that they can rebuild stronger. As I understand it, when you lift weights, you create tiny tears in your muscles, and it’s the rebuilding process, when your body repairs itself, that actually makes your muscles stronger. With more intensive workouts like the 30 Day Shred, you don’t stop to rest between working out groups. I hope that the Body Revolution actually tones my muscles more than I’ve experienced in the past – but first of all, of course, I need to do the workouts first! The kit comes with three cardboard sleeves, pictured above, which have the DVD collection inside. 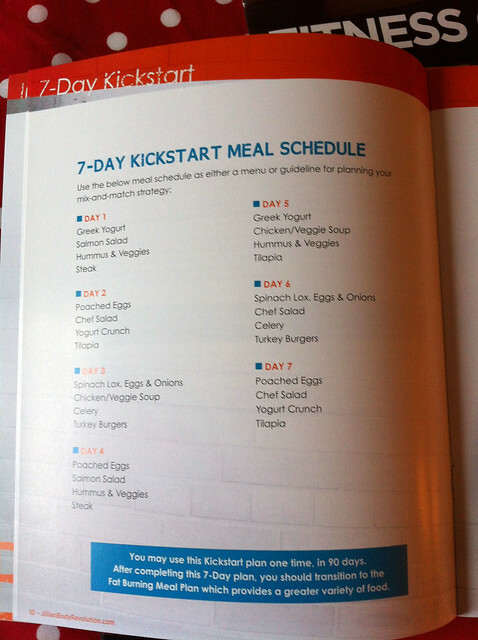 There are also various booklets that go with it, including a meal guide for her 7-day kickstart programme. Inside are a range of meals for breakfast, lunch, dinner, and snacks for you to eat during a week-long period at the start. 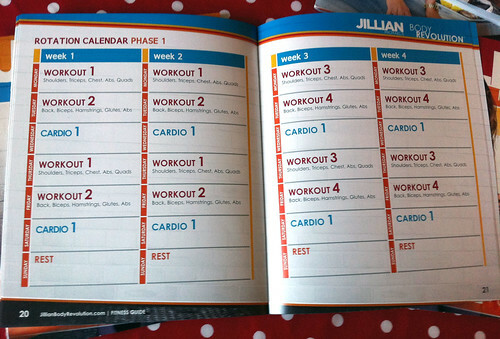 Jillian is very clear that you only do this once during the 90 days, as the diet is restrictive, and the exercise schedule is pretty intensive. This is the diet plan I’ll be starting tomorrow, along with the exercise plan. I’m waiting for my shopping to arrive! I’ve bought items to make most of the things listed – the recipes are in the back of the book – so we’ll see how I go from tomorrow… The hardest thing will be avoiding tempting Easter treats! The recipes aren’t low in calories, but I do think they’re very low in carbohydrates. Hopefully there’s enough protein in there to keep me going! Here’s the workout plan for the first week – I’ve cheated a little bit and I already started yesterday, doing cardio 1 and workout 1. But I aim to start properly tomorrow and then work through until next Friday. Over the weekend I’ll perhaps do cardio again and rest on Sunday, so that I can then start Phase One as it should be on the Monday after Easter. As you can see, it follows a neat pattern which is pretty easy to understand! I really want to make sure I start it on a Monday, because having a real, set in stone schedule is very important to my ability to stick to it. I think that if I alter the schedule in some way, I’ll start making excuses as to why I can put off doing one of the work outs, so I want to eliminate that risk before I even start! Anyway, each block of exercise is approx 30 minutes, which really isn’t a lot to ask in a day! This is what I’ll be staring at for the next month! This is the inside of the cardboard sleeve for Phase One. I’ll be back tomorrow to review the first day on the Kickstart plan!